I am supposed to be posting about the Dirty Jobs that are done around the farm on a very regular basis. 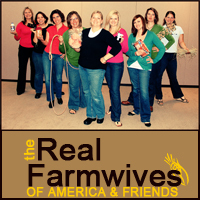 Today is the day where the gals that make up the Real Farmwives of America and Friends all blog about the same subject pertaining to the farm. Go check out my gals over there. They rock. Unfortunately, I don't live on the farm anymore and I haven't been around the farm while my dad and brother-in-law are actually doing any of those sort of jobs. Not that they haven't been working...they have. After an incredibly wet spring, they were able to get into the field and get all of their corn and soybean acres planted. Then it rained again and again! So, I'm sure I could have captured shots of their muddy boots and tractor tires. But I didn't. I did grab this shot recently (OK, tonight actually). I've always loved my dad's hands (and his farmer tan). I know I'm a bit strange, but to me they are both very visible reminders of who he is and what he does. You can't look at those hands and think my dad sits behind a desk. But he is a business owner, a marketer, an accountant...he just gets his hands dirty more often than he sits in meetings. So, here's a salute to all of the dirty jobs my dad does without a second thought. I'm glad that he goes out each and every day with the intent to grow things...nothing more, nothing less! I found the following on the original "Dirty Jobs" guy's website - www.mikeroweworks.com. I think it sums up why farming can be dirty! I'll be honest it did bring a tear to my eye - I have always loved Holly Dunn's song "Daddy's Hands" - and this post is just as good! ME too Jent! The funny thing about Steve's hands is that if you looke at them from the top, he has a tan line that stops at the first joint. That's because he has the rest of his fingers curled around some kind of steering wheel. He likes to tell people they were cut off and sewn back together when he was young. Gotta tolerate sick farmer's humor some days! Great post! Great post! I feel the same about my hubby's hands. Just looking at them reminds me of how hard he works. They are always covered with band aids, cuts, scrapes, and sometimes a little grease! Great post Megan! I'm with Jent...I love that song and my dad and I danced to it at my wedding. So sweet! I was also thinking about Holly Dunn's song as I was reading, it gets me all teary just thinking about it.